Shield your eyes comfortably with rimless clip on sunglasses in men's and women's styles from the variety here at Walgreens.com. These clip on sunglasses combine the convenience of being able to wear them with prescription glasses and the benefits of glare reduction. Different tints and colors with UVA/UVB protection are available here in trendy, classic or contemporary styles. 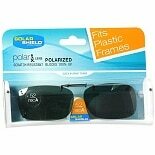 Find rimless clip on sunglasses in a shape that fits your glasses from the assortment available from brand Solar Shield clip-on sunglasses. Both men's sunglasses and women's sunglasses are available in an array of colors and frame styles. You can choose different pairs of sunglasses for different activities, or have several pairs so that you aren't ever without them. There are also convenient flip-up clip-on sunglasses so you can easily flip up the sunglass lenses when you go indoors.